In response to the recent string of suicides by drivers, the New York Taxi Workers Alliance has launched a campaign for regulation and released its own proposal to re-establish driving as a viable occupation. On April 25, the Taxi Workers Alliance demanded that city leaders address the lethal impact of lax regulation of app-based, ride-hailing services at a press conference in front of City Hall. The conference preceded a hearing on April 30 concerning regulations for app-based companies. The business model offered by Uber and Lyft, they argued, has been instrumental in lowering labor standards so that drivers from across the taxi industry — whether they are behind the wheels of yellow cabs, green cabs or black cars — are literally working themselves to death. Ride-hailing companies have gained notoriety for being able to put an unlimited number of vehicles on the road, underpaying drivers and even going so far as to not recognize them as employees. This has created a “race to the bottom” with severe repercussions. Before shooting himself at the gates of City Hall Park, Douglas Schifter called the industry in which he’d been working for decades “the new slavery.” Schifter wrote this in a suicide letter he posted on Facebook and blamed the Taxi and Limousine Commission, the Mayor’s Office and Gov. Andrew Cuomo for promoting deregulation without regard for the impact on workers. 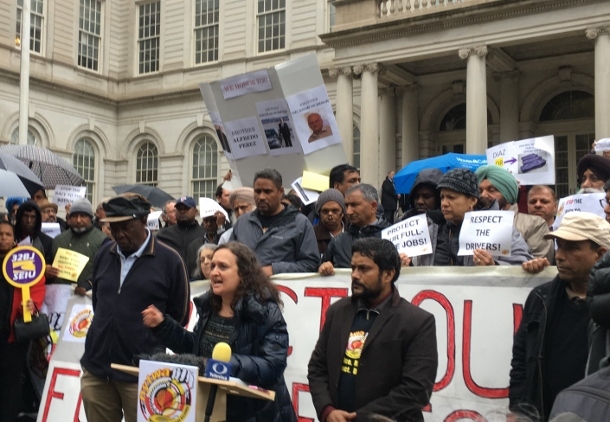 Joined by fellow founders Biju Matthews, Beresford Simmons and Taxi Workers Alliance organizer Mohammed Tipu Sultan, the NYTWA’s executive director Bhairavi Desai addressed the assembled drivers and members of the press. “No matter what Uber wants to claim,” she said, “this is a struggle about the workers trying to defend a full-time job in a gig economy that offers nothing but poverty pay.” Founded in 1998, the alliance currently represents over 50,000 drivers throughout the city and has affiliates across the country. It has played a pivotal role in defending workers’ rights and livelihoods from the impacts of deregulation. According to Matthews, the situation created by Uber and its peers has taken a broad psychological toll on drivers. It is a situation that became even more dire due to Uber clogging city streets and shrinking worker income by constantly adding new vehicles. He hopes this is the last spate of suicides, noting that the alliance regularly refers drivers to suicide prevention services. Danilo Castillo Corporan leapt from the window of his Manhattan apartment in December of 2017 after being told by the Taxi and Limousine Commission that he could lose his license for picking up an illegal hail. Charges against him were dropped the day after his death. Castillo penned his suicide note on the back of his summons, citing the “disastrous state” of the industry. Corporan had been a Bronx-based driver, as was Alfredo Perez who also committed suicide earlier this year. On March 16, yellow cab driver and medallion owner Nichanor Ochisor hung himself in the garage of his Maspeth home. He, like so many other drivers, found himself starved of fares after Uber led the charge in flooding the streets with vehicles. Ochisor and his wife both worked but found their combined income to be half of what he had been making individually before app-based cars flooded the streets with the blessing of both Gov. Cuomo and the mayor’s office. Last year there were a total of 83,000 app-linked cars, which outnumbered the city’s remaining yellow and green cabs. Increasingly burdened by mortgage payments and mounting debts on his medallion, Ochisor saw no way out. In response to these tragic suicides, the Taxi Workers Alliance has gathered drivers from all sectors and their allies for repeated demonstrations in front of City Hall. They demand action to address the wide reaching harm caused by ride-hailing companies’ dominant position in the gig economy and their antipathy to regulation. These are not limited to promoting hazardous labor conditions or normalizing inconsistent and low pay. Companies like Uber and Lyft have also ensnared drivers in a web of predatory financial relationships and have been accused of discriminating against disabled passengers. City council member Ruben Diaz Sr. and members of Disabled In Action Metro NY, a group fighting for civil rights of disabled people, are among those who have joined the taxi drivers in this fight. Working incessantly while earning very little is a norm across the industry. According to one study, 41 to 54 percent of Uber drivers make less than minimum wage. According to Taxi Workers Alliance member Bigu Haider, it’s common to work 70-80 hours a week and have nothing left over after paying rent and other living expenses. “If you want to save, you have to add 100 hours,” he said. Before taking his life, Douglas Schifter wrote he had regularly been working 100-120 hours per week. In response to these companies’ intransigence when it comes to being regulated, Ruben Diaz Sr. is backing a measure that would require the city to vet new app-based services. Only those that fulfill an “actual need” would be allowed to operate. Additionally, this legislation would require drivers to work with only one company. Battling against diminishing incomes, many drivers currently shift from driving the city’s cars to working under one or more ride-hailing companies on a regular basis. The Taxi Worker’s Alliance has put forward its own position, though. Their plan offers a model for fair labor standards that would also check the power ride-hailing companies have gained in New York. A cap on the number of ride-hailing vehicles, a wage floor based on the yellow and green taxi meters, an increase in fares, industry caps on drivers’ expenses and an end to predatory leasing practices are among the key points of the plan. “We are asking for an immediate moratorium on new cars,” Biju Matthews explained. “Then, through attrition we have to bring the numbers down.” The cap itself, however, will not provide a solution to drivers’ woes concerning pay and saving. That is why Matthews says the wage floor is crucial. The plan also demands the city’s congestion pricing scheme, which would fund maintenance of the MTA, not burden drivers and that the city implement the health and wellness fund, which is the product of Taxi Workers Alliance victories in 2012 and 2013. I agree with all the comments about the need to regulate the gig economy corporations who undermine regulation, health and living standards. However as a model of non-violent action NY taxi drivers illustrate an important point. You need mass support to combat the powerful and wealthy, so your industry needs to have integrity and social value to persuade the non-involved. In our city in another country, exactly the same is happening and I see Uber succeeding because the taxi industry had previously not behaved well towards its customers in essentially a monopoly situation. So the broader sympathy you need for a campaign has to overcome the notion that change might be an improvement. My quintessential NY story is of arriving at the airport and being given a leaflet on my rights as a taxi customer and having to win a tug-of-war with the driver on the way into town as he tried to pull it from my hands. The more stories like that in people’s minds the harder to build a campaign. Non-violence is not going to be easy, it has to be built on a secure bedrock of social values. Liberal (#metoo) Hollywood and the union movement are other examples where attention to values internally is as important as an external focus. Nevertheless I wish the taxi drivers well. When you are using the violent power of the state to stifle competition you are not waging nonviolence. You are waging war. Withdraw your power and money from the state whose laws help the rich get richer at the expense of the poor. Workers can start their own “Uber” type services. Taxi cab owners already have been screwed by the state by thinking their state-violence-enforced monopoly would last forever. This makes NO SENSE and your use of hyperbolic language with NO FACTS leaves your “argument” with no foundation. Uber is not “the poor”, they are a multinational, multi-billion dollar company that wants to undercut smaller businesses like the worker-owned co-op where I work by not paying for the proper permits and insurance. They want to drive us our of business just like Wal-Mart did to so many small businesses. Uber marginalizes the poor by refusing to service large segments of our city and not providing service for those with disabilities. And too bad if you’re too poor to have a smart phone. The only people getting”screwed” are those getting assaulted by un-permitted Uber drivers. Sounds like a “violence-enforced” monopoly to me.